Treyshon Malone sprints away from his competitors in the 200m. Arizona Milesplit Photo. The Knights of Columbus Invitational was held Saturday at Bourgarde Catholic High School. It was one of those, rare, athlete friendly meets that starts at 9 AM which meant cooler weather for the early races. The races that benefit the most from the early morning start time are distance races. Horizon Honor's Trevor Tam took full advantage of cooler conditions in the 1600m. Crossing the finish line in a time of 4:37, he now sits in 4th position for division 4. The race did not unfold without some intrigue though. After Trevor led for the second and third lap, Scottsdale Prep's Hayden Shelly took over the lead on the 4th lap. Trevor came up on Hayden's shoulder on the final turn. Their times were just a couple tenths of a second different, as Trevor prevailed in a photo finish. This was not his only victory on the day. Going into the 800m Trevor had the top seed, and he made good on it. Leading wire to wire, Trevor finished in 2:05 just over Dominic Bronson (Arete) and Cooper Harris (Scottsdale Prep). “Usually I like to sit and stay on other people's heels, but if the race is going slow I will lead," Trevor explained about his strategy. He added, “I always try and place as high or higher than my ranking, no way I was going to let anyone get by me." Trevor was not the only distance runner on the day to employ a front running strategy. Leading wire to wire is not always a preferred tactic but this weekend it proved very effective. In The girls races 800m Luisa Aleman employed a similar race plan to edge out Rachel Matsumoto of Tempe Prep. The 3200m races were a very similar story as well. The winner, Haley Everroad, who put almost two minutes on teammate Emma Kar and Yuma Catholic's Mimi Sterenberg never was seriously challenged. Haley would have had preferred to have more runners up with her. “Usually it's hard to compete without anyone around," she explained, “My goal was to do my best. I am pleased with my performance." Being satisfied in how one runs is important. Ultimately you can't control the other runners, you can only control yourself. Boys 3200m winner Brendon Allred of Lee Williams had a much closer race. Brendon tries not to worry who is around him. “I could care less about my place," he explained, “I just go out there and give everything I can give. If other people beat me that's their deal." After running with Brendon for most of the race, Adam Wong of San Pasquel finished only five seconds behind in 10:30. For those of you who don't know Lee Williams is up near Kingman Arizona. Brandon credits his environment for hlpeing at the longer races, “I love training there [Kingman], I love the mountains it gives us an advantage at races like this." If the high altitude and cool weather gives distance runners and advantage the heat and warm weather certainly gives the sprinters an advantage. Not surprisingly, Treyshon Malone scored more points than any other athlete at the meet winning all four of his events. “I felt like it went well" he recounted afterwards. 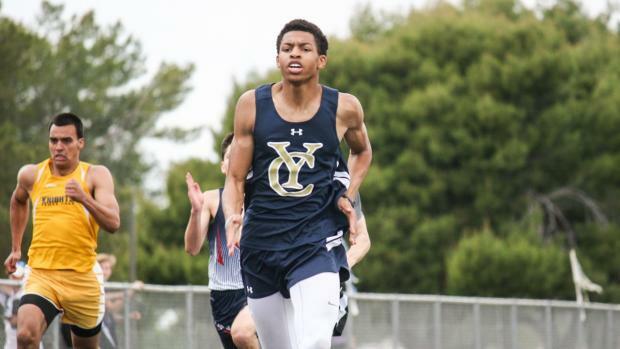 Though Treyshon made it clear he wasn't satisfied with just winning at Invitational meets. He wants to make some noise in a couple weeks at the state meet. “I want everyone to know what I can do even though I am just D4." His performance in the long jump actually ranks him nationally. Expect him to turn more heads at state as he continues to improve. The added competition should help him there. “I like the close competition because it makes me work harder." There was some fantastic competition at the Knights of Columbus Invite as well. Just ask Lee Williams freshman Melisa Davis. Chasing down Scottsdale Prep state qualifier Katie Williamson on the final home stretch, Melisa's 300H victory was one of the dramatic wins on the day. “I wanted to beat her but I only focused on the next hurdle," she said smiling after the race, “The intensity going through my blood made me want to go faster." That intensity carried her all the way to a 51.84 time, nearly equaling her personal best set earlier this year at the London Bridges Invitational. While for some this was the last meet of their high school career for others it was a final tune up for state. Look for Arizona Milesplit coverage at the state meet in a couple of weeks. In the meantime, check out the state rankings or do a mock meet.